I have now finished mapping most of the Whanganui area except for East Town and have decided to do a full Volume 4 with aerial photography for the entire route to New Plymouth, branches and the SOL. There will not be any more Retrolens historical stuff done for MNPL as there are no images available for the area, so what is traced onto the map will be what can be seen from the ground in the base imagery only. At the moment I am getting all the aerial photography needed downloaded from the LINZ site and imported into Qgis which takes a while to sort through. Overlaps at the edges of different batches of aerial imagery are another complication to be resolved. I have completed mosaics for East Town and the Castlecliff Branch using the aerial photography I was able to obtain. The initial attempt at a mosaic for the Castlecliff route used 0.1 m aerial coverage for Whanganui City which proved to be very demanding to work with as it required up to 64 individual map tiles and massive enlargement of the historical images which resulted in a 12 GB file taxing the computer's memory significantly. Redoing it in 0.3 m aerial coverage only needed up to 16 tiles and produced a 2 GB file. The resolution of the base imagery is unimportant for mosaic tiles because the historical stuff is what is actually visible as we are only using the base to align the historical stuff to for georeferencing and when we need to display the modern imagery the 0.1 metre stuff can be separately loaded in the GIS. Although no Retrolens coverage is presently available, occasionally there is enough on the current aerials plus a really good Whites Aviation picture for it to be worth while to create a station layout by estimating the size and position of various features in relation to known existing ones and so I drew this diagram of what Kai Iwi used to look like. The WA coverage was from 1949 and 1955 when the station was open, and also confirms the bridge realignment just upmile of the station. Here we can see that Kai Iwi was a busy little station in its day, it had the usual things you'd see in a rural station, including five houses for staff. The current station building, which I assume Kiwirail has sold off, is probably concrete, a replacement for the wooden one shown in the earlier pictures which was much larger, and it still sits there on the platform. Pretty much everything else has disappeared. No idea on when the bridge was replaced. 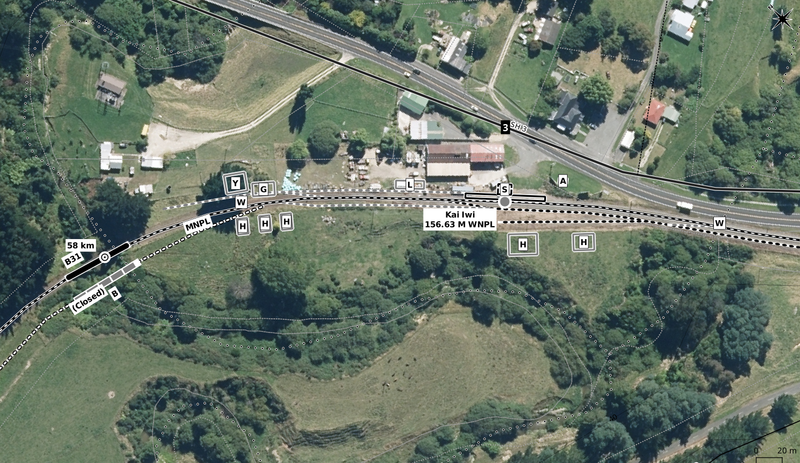 The Kai Iwi crossing loop, which appears to be, like Ruatangata, a recent addition (late 2000s) with the extension of CTC on the route, can be seen going out of the east side of the image. The siding which comes off at the west end is not part of the original station layout, so we can assume nothing was left of the original station when the present loop was installed. Prior to the extension of the CTC, only Marton-Whanganui was worked by it, with electric train tablet on other parts of the MNPL converted to track warrant, as well as automatic signalling on the SOL to track warrant. I am unsure as to how far the CTC runs on the MNPL now. Just to add to all the existing mileage controversies, the Quail Atlas, which created one with their metric distances that vary from the ones in the Working Time Table, has in the first edition used different mileages from the ones I have used on these MNPL maps. Kai Iwi as an example is shown as being at "148.09" miles. Likewise their distance for Marton on the NIMT is shown as being "311.02" miles from Auckland, or "112.00" miles from Wellington. The respective distances from the documentation I am using (NZR W&W track mileage diagrams) puts Marton at 116 miles 28 chains from Wellington and 309 miles 37 chains from Auckland. These distances are the same as the ones in the NZRLS 1947 WTT reprint that is a secondary source for me. Hence once again where have the Quail people got their distances from. Going all the way back to Wellington the early distances are correct and the possible sources of error not at all obvious, but they just gradually creep in. As far as I am concerned the maps will keep using the mileage sources they currently have, and the key and each PDF volume will have explanatory notes about the mileages (another issue for the maps is I have converted miles and chains into decimal miles, so that the decimal point means the same thing for both imperial and metric distances which are intermingled all throughout the maps). Where some of the Quail stuff comes from is not clear, unless they have a more recent imperial WTT as a source. The problem with changing sources is that the stations that have since closed will not appear in the newer source. This is why I am currently attempting to source a early metric era WTT to have as much metric data from a WTT as possible, and not showing any metric distances other than those which can be obtained from a WTT.